If you’ve done your research and reading, you’ll learn that one of the very best products available is Joint Vitality. 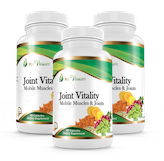 Joint Vitality offers a comprehensive and complete solution for joint health. Rather than just treat a symptom or offer a particular trendy ingredient, Joint Vitality uses a scientific, multi-pronged approach to deal with each of the root causes of joint discomfort based on its unique formulation of ingredients. I only took 3 capsules in the morning and the next day I thought "Oh, I haven't even noticed my knees.... it must have been that joint product". Its been so good since I have been taking your joint vitality, my knees don't even hurt. at 61yo that's quite something. Sometimes I forget for a few days, then realise I haven't been taking the capsules because the pain comes back. Thanks. Last year I was very run down, I had a bad knee and could hardly walk. I was very miserable as I've always been an agile and active sixty five year old. I couldn't do my gardening and felt very depressed and I was limping so I couldn't go for walks. Then I took Joint Vitality for six months and it picked me up, I went back to walking and swimming. Then I had an Xray on my knee and the doctor said that my knee was much improved and gave me another ten years before any surgical intervention. 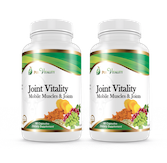 So I'll continue using Joint Vitality as I feel these supplements will maintain my mobility for years to come..